Si Ling slot immediately announces a Chinese theme to the game and indeed it is another in Playtech's grand plan to produce an Oriental slot for every family in China. Make sure you don't mistake Si Ling with Si Xing, another slot with a similar theme from the same developer - sigh... Si Ling can mean 'seen and heard' but in this case it refers to the 4 Divine Emperors and each is represented by an animal on the reels. We are spared the usual pipe-and-cymbals music and just have basic sound effects as the reels stop over a soothing classical piece. So what pay out ceiling will Si Ling offer you? We have no pay lines as there are 243 ways to win on Si Ling and all the symbols appear stacked including the scatters. There stacked Wilds in the form of coins appear on all reels and are the best-paying 5-of-a-kind at, wait for it, 1.67x your bet or in other words 100 coins when you must bet 60 to play! The red Eagle's head pays 50 coins, the blue and purple Dragons 40 and 30 respectively and the green Turtle 20 coins. The card icons make up the remainder and get your microscope ready to see these pays, from 0.25 down to 0.16x bet for the 5. These all need a 3-of-a-kind minimum bar the top two above which pay for 2 symbols, a staggering one twelfth and one twentieth of stake! The scatters will trigger a free spins bonus if you land 6 or more in view on the grid. There is no pay for these so if you were imagining a full screen of 15 for a huge pay like Microgaming's Secret Romance has, think again. The best pay is a full screen of Wilds paying 405x bet. 3 spins with Wild super-stacked. 5 spins with Eagle super-stacked. 11 spins with green Turtle super-stacked. 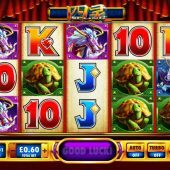 Si Ling slot is a classic example of a developer producing a 'shelf filler' game by amalgamating ideas from a few different games into one. And as is often the case, the result is neither here nor there. We get a divine 96.61% RTP but as you may have guessed by reading above, the volatility is extremely low as is the potential. You can get a full 3 stacks matching on the first 3 reels and get less than 2x your bet for example. The graphics, sounds and mechanics are simply mediocre - the only blessing is that your balance will probably last for a lengthy bit of play and therein lies the slot's use: if you want to convert a bonus wagering requirement! Other than that, this is another Oriental slot that will likely get lost in the smog of a big Chinese city.